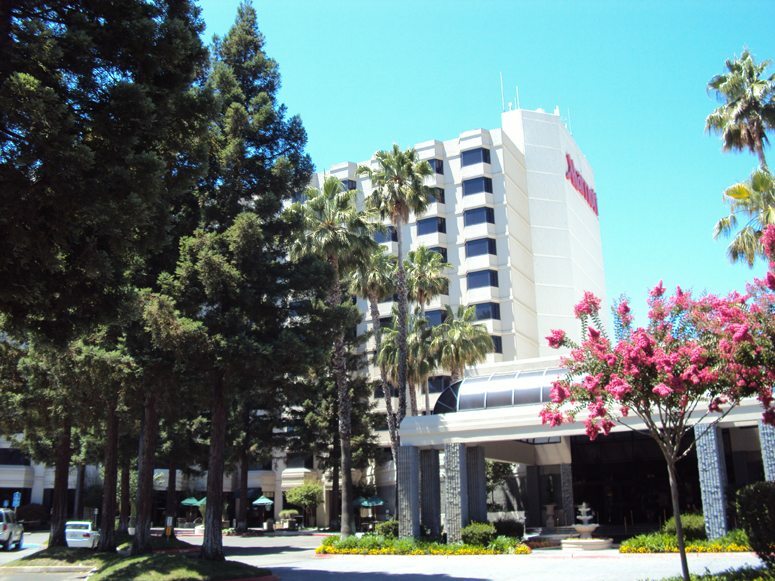 Recently I took a quick trip to Sacramento and I decided that while I was there, I would use the opportunity to review a licensed location, far away from Seattle. I rarely talk about the licensed stores but they are an important part of the brand image, and since there was a huge Starbucks right in the lobby of my hotel, I am going to review it. 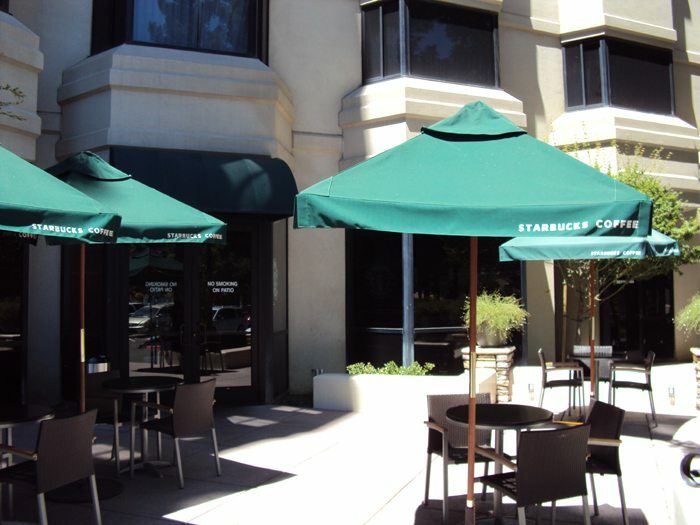 This Starbucks has an exterior entrance but largely connects to the lobby of the Marriott Hotel located at 11211 Pointe East Drive, Rancho Cordova, CA 95742. The manager is Vivian and I happened to meet her at the store, as well as another barista named Brett. I ordered a blended strawberry lemonade (it’s very hot outside) and inquired about the store’s participation in My Starbucks Rewards. 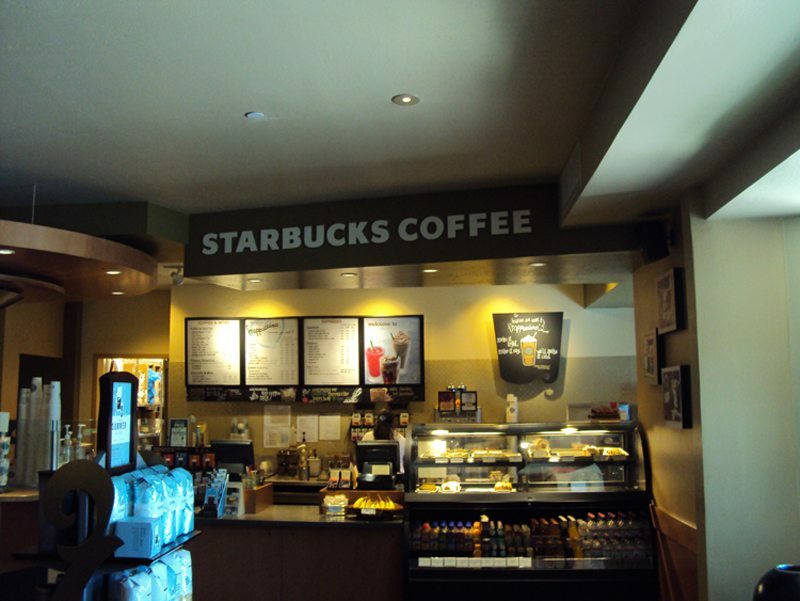 I learned that this licensed store accepts the Starbucks card as a form of payment, and earns you stars with each swipe however does not participate in the remainder of My Starbucks Rewards perks, such as free milk changes, free syrups and free tall beverage with a purchase of a pound of beans. Vivian and Brett were extremely friendly, and Brett shared with me his favorite custom drink: A blended strawberry lemonade with raspberry syrup added and whip cream blended in too! He says it tastes like a Starburst. There was a pretty complete array of merchandise available, and standard full beverage menu too. The store boasts a small whole bean wall. One thing to know is that this store closes fairly early. On weekdays it closes at 4 p.m. and on weekends it closes at 1 p.m.
Would I recommend this store to a friend? Absolutely. It had extremely friendly partners, a spotless lobby, and it looks and feels much like a corporate store. I think I got very lucky because this was a really fabulous licensed Starbucks location. However, since this licensed store really mimics a corporate store, I think there is room for a lot of possible confusion for those customers who are used to free soy milk or free syrups. Also, unlike many licensed stores, this Starbucks has a tip jar too. It seems as though many of licensed locations don’t have a tip jar, though I don’t know if that’s the norm or not, but it seems that way to me. My trip to the Rancho-Cordova area/Sacramento produced three store reviews, and this is the first of the three. Two more will be posted soon! 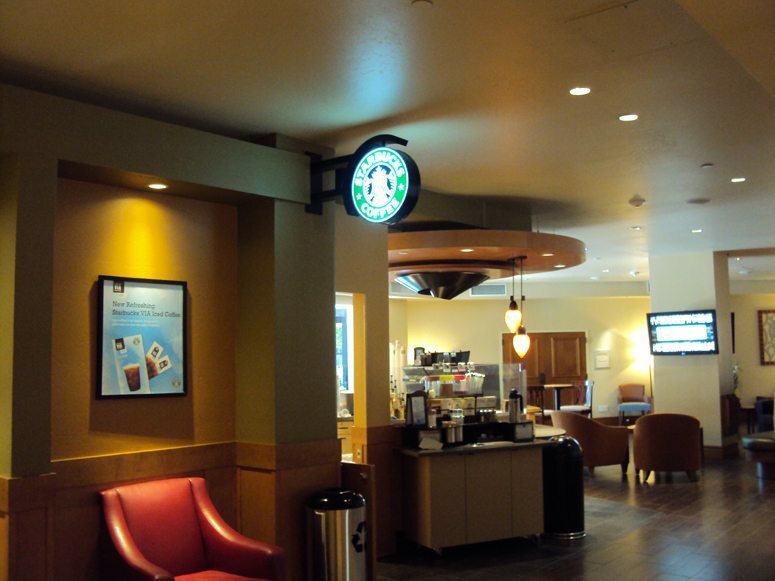 Ownership stories: (1 of 2) Austin, TX LEED Starbucks: The lights were on. The doors were open. We met the house sitters. Normally, in my opinion, those hotel-stores like inside of this Marriott, are not very interesting…I have been to a few in SF and DC Metro and they looked all very similar and standard. But as I can guess from your pics, this store seems to be a little more individual, has a very nice outdoor seating available. The interior is very comfy, too. In general, it is just AWESOME to find Starbucks even inside of hotels…would be interesting to know when and where the first store opened inside of a hotel. In Germany, we are far away from this concept and I can’t imagine to find this here even within the next years. Great review Melody. Interested in knowing what the prices were for this licensed store. I have had the experience of some licensed stores in hotels where the prices are sky high. 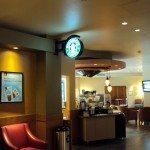 I also have been to a starbucks connected to a hotel where it was a corporate store. I really wish SB would get their act together as they had promised a bit back to get the licensed stores in line with the corporate stores. Glad there seems to be nice partners working there! I love that you find the hotel with the Starbucks in the lobby…no bad hotel coffee for Melody! Did they mention if they accept the free drink postcards? I understand you don’t get the other perks…but if you are still earning stars I thought they may have a way to accept the postcards. found you through “my pretty pink bloggette”… and seeing whereas i am a coffe/ starbucks whore.. i am SO STICKING around here.. hope you don’t mind another reader!!! fun fun place ya got here!!! As a partner, I find some of the licensed stores to be a welcome change, usually in the food department. Airport locations are fairly similar to corporate locations, but the hotel stores like this one sometimes have great sandwiches and pastries that are prepared in the hotel kitchen. The quality (simply because of the limited time between preparation and sale) is much higher than I’m used to. Glad to hear you had a nice trip to Sacramento, sorry I couldn’t sneak up and see you while you were there, but my (now) wife probably wouldn’t like that idea the day after our ceremony! 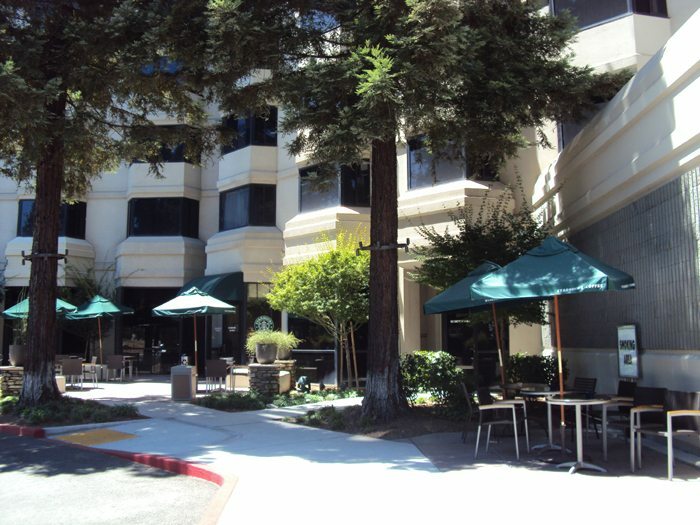 What a neat little Starbucks – but what a huge patio they have at this location! Great find, Melody. Glad to hear you had a great experience here! I don’t recall ever seeing a tip jar at a licensed store. For a few months I was making weekly visits to a community college, which had a licensed store in its student cafeteria. Excellent service, and I could always count on a good brewed coffee (in fact, that’s where I had my first cup of Yukon Blend). The shopping center closest to my house has a corporate store with very little seating and a licensed store inside Target with tons of seating and a machine that produces much better steamed milk! I like to drive around more rural areas, where the only Starbucks are licensed ones. Never noticed any significant price differential, but then again, I never paid attention to the price. When I need a latte, darn the price, I NEED THAT LATTE NOW. Looks like a rad licensed store. I worked at a licensed store in High School for a few months and it was NOT as well organized as this one appears to be. It was absolute Hell. Glad I eventually went over to a corporate store when I started college. Its relieving to see there are licensed stores that give Starbucks a good name. There’s no small number of licensed stores in my town, and they run the gamut. There’s one in the local Barnes and Noble bookstore that’s quite nice and gives an authentic Starbucks experience (with a few minor differences, such as their whipped cream coming from a can rather than being made; they’re also missing a flavor or two, but occasionally have flavors we don’t). Their baristas are friendly and seem fairly knowledgeable. I can’t remember going there and being disappointed. There’s one in a local grocery store; I haven’t gotten anything from that Starbucks, but I’ve heard horrible things about their service, such as their “baristas” being hideously rude and outright mean. And then there’s the one that’s the bane of my existence: the one in a local hospital. I have no idea what in the hell they’re doing in that “Starbucks,” but whatever it is, the end result is nothing on our menu. Apparently their stuff is tasty, and I can’t fault them for that. But every time someone comes in ordering something insane (“Do you still have that drink with the goat milk and the crushed almonds? What about that papaya coconut drink?”) and says they got it at Starbucks, in invariably came from that hospital. That’s the problem I have with licensed stores – they can do pretty much anything they want, and because the sign says “Starbucks,” people think that all Starbucks do what they do. I’d prefer that there were more consistency and Starbucks corporate oversight in regards to licensed stores. 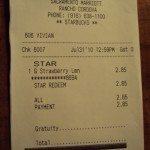 I cracked up when I saw on the receipt you could charge your drink to your room. I imagine a lot of Frappuccinos may get put on parents’ bills during vacations. Also, did you note if this license store had a Mastrena or Verismo espresso machine? It seems all the new licensed locations in Los Angeles have the Mastrenas, while my “favorite” digs have the Verismos…which make a poorer drink IMHO. It’s nice to see some hotels with quality coffee. 90% of the time, I’m stuck at the hotels where their definition of quality coffee is the in room, stale pack of ground coffee. 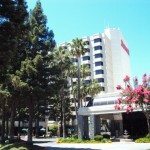 I have to say that some of the best licensed store experiences I have had have been at Marriotts and other full service hotels. 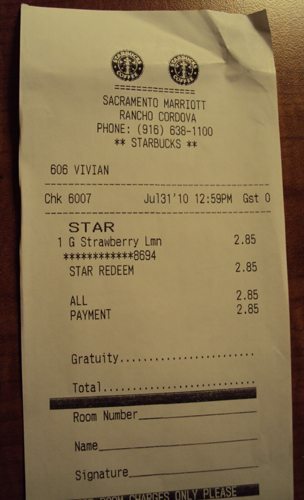 Not the “we proudly serve” hotels, but the ones that have an actual (licensed) Starbucks on their premises. Licensed concept stores are different here in Canada-i.e. if you see one in Chapters (bookstore) it is NOT the same as one in Barnes and Noble. 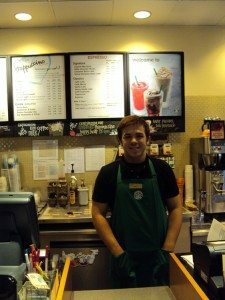 They actually have to stick to standards to a T and carry all of starbucks products -both behind the counter and as far as merchandise. Although, there are many within Chapters that are actually corporate stores. 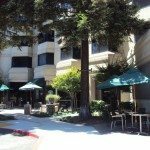 So the whole “if it’s in another building, it’s not really starbucks” drivel that people like to say on MSI (sorry Mel…)…is not necessarily true. We also have some really , really bad licensed stores in Safeways in town though. CABarista: that’s cool. That’s how I wish all licensed Starbucks were. To be fair, though, most of the ones that I’ve been to in various Barnes and Noble stores have been very, very close to “regular” Starbucks, with the main difference being a very slight variation in syrup variety (“you don’t have toffee nut?” “no, but we have coconut as a summer seasonal syrup!”), and them using canned whipped cream. Oh, and their pastry case is totally different. Barnes and Noble seems to keep on top of their Starbucks license and does an excellent job of providing a Starbucks experience. Maybe it has to do with the general design and philosophy of the different types of stores. Barnes and Noble, much like Starbucks, seems to follow a “third place” philosophy – a cozy place where you can sit down in a comfy chair with a book in one hand and a latte in the other and just chill for a while. Barnes and Noble, therefore, will do what they can to enhance that environment, and that means that sticking with the Starbucks coffee-house mentality is in their interests. Grocery stores, on the other hand, are not places where one typically goes just to hang out. They’re places where the customer goes in, picks what food they want off the shelves, and takes it to the checkout counter where someone scans it and stuffs it in a bag for the customer to take away. They’re not places where the shelf-stockers and checkout clerks lovingly craft delicious beverages – they’re places where those people give you the stuff so you can go home and handcraft your own beverage. Because they have more of this warehouse mindset, the Powers That Be in these stores probably aren’t going to be interested in all of the necessary details in making a good Starbucks experience. They just see an opportunity to sell expensive coffee for people to drink while they’re roaming up and down the isles. I think that you could be right. I know the Chapters (I work at one btw) philosophy is very close with Starbucks. I only wish we could do the Coffee Master’s program :(. I know there are a few of us who would do it in a heartbeat. We are very passionate at our cafe. Here, at least, I don’t want to bad mouth-but the grocery store locations are horrible. They can be told how to make a drink and still not do it correctly. I’ve had to re-convert a customer to her latte after a safeway used a dead shot in her drink the last time (the best that I could figure out). They seem to have zero training and passion. Which is sad (for starbucks name and brand). I’ve been to this Marriott but hadn’t gone to the SBUX yet. But it is in a very nice setting, very beautiful, roomy and like a lounge. I will definitely go there next time I’m in the area and am so glad to hear that they accept the gold car! and will get my stars!. 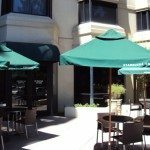 There are also two SBUX in the area–one by the Red Roof Inn off of Zinfandel and one in a new shopping center across from the Fairfield in off Zinfandel Both are nice. 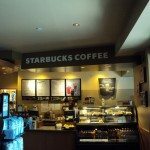 @1yogagirl – That area has some great Starbucks. Read the comments to the Alhambra blog post – The barista Juli who replied wrote a GREAT comment about Starbucks in Rancho Cordova/ Sacramento area. And yep, this store (Marriott) has a very roomy lobby area. Thanks for commenting!